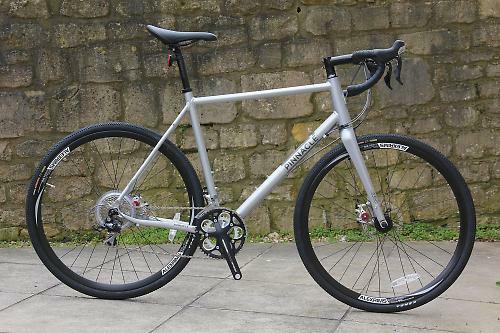 More and more people are turning to disc-equipped commuter/cross bikes as a versatile do-anything bike, and the Pinnacle Arkose Three is a very well-rounded example of the genre. It sneaks under the £1k cycle to work limit with a mostly Shimano 105 drivetrain and good brakes. It's a good ride to boot, and light enough for a crack at a CX race if you fancy punishing yourself for an hour. The Arkose frame is a solid-looking thing, fashioned from 6061 aluminium alloy. The welds are pretty tidy, if not beautiful, and the silver finish looks tough and has proved to be exactly that. The head tube is tapered from 1 1/8" to 1 1/4" as is common these days to beef up the stiffness at the front. 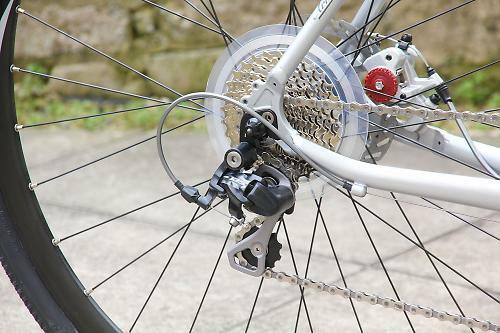 The fork has carbon legs, with mudguadr mounts; these are positioned on the outside of the fork leg and a couple of inches up from the dropout to keep the mudguard stays from fouling the disc calliper. There's plenty of room for a mudguard and the Kenda Small Block 35mm tyres, you could probably go a bit bigger. At the back the disc calliper is mounted to the top of the chainstay as is becoming increasingly common. That means that it's out of the way of the mudguard and rack mounts (the Arkose dropout has holes for both) but it does present some other issues, which we'll come to later. All in all the frame is fairly chunky, in its welds and tube profiles, and the fork matches that look. You'd expect a chunky alloy frame with a tapered steerer fork to be a stiff ride, and that's certainly the case here. The Arkose has a solid feel to match its solid looks. My testing has mostly been commuting (road and path) and a few longer rides, but I also threw the Arkose round the Hell of the North Cotswolds CX sportive to get a feel for its handling on the proper rough stuff. All in all, I've been impressed. It's not a whippy or particularly twitchy bike, but it has enough poise for most types of terrain. The firm front end transfers a fair bit of shock on a rocky descent and you have to hang on a bit but you'd expect that from a rigid bike running 35mm tyres and it's no worse than others I've used. On smoother surfaces the bike is well-behaved: it tracks well, the steering is neutral but responsive to your input, there's no flex in the bottom braket and rear triangle when you put the power down. On tarmac the bigger air chambers of the tyres make it more comfortable than a full-on road bike, if also a bit more sluggish. The Kenda Small Block tyres are more or less the best compromise you can get for multi-terrain use. They can cope with most off-road situations (although they're not very happy in thick mud) and roll well enough on road. If your use of the bike is going to be exclusively restricted to tarmac, you'd be better off swapping them out for a good set of 28mm slicks. The tyres are on decent enough wheels: Joytech hubs and Alex CXD26 disc rims. They're not light but they stayed stiff and true, and you're unlikely to really be hindered by them unless you fancing throwing the Arkose at a proper race. The bike's overall 10.7kg weight won't slow you down too much, anyway. The Shimano 105 transmission performed faultlessly throughout. It's still my first choice in terms of performance versus value. Shifts are crisp and easy from hoods and drops, the under-tape cable routing keeps things neat. Pinnacle have saved money with an FSA chainset and a Tiagra front mech, neither of which significantly impacts on performance although it's my experience that Shimano rings last quite a bit longer. However, it's worth noting that a lot of disc-equipped bikes at this price point are running Sora, which is two rungs below 105 on the big Shimano groupset ladder. So the Arkose is certainly good value for money in that regard. The compact chainset and 12-30T rear cassette mean that there's more than enough gears for nearly everything, although if you were sticking a rack on and going for a big tour you might need to adjust the gearing, possibly by swapping the chainset for a MTB 2x10. Brakes are Avid's BB-7 callipers which have been the go-to mechanical brake for quite a while now. As ever, they performed very well throughout testing, with plenty of power on offer in all conditions. 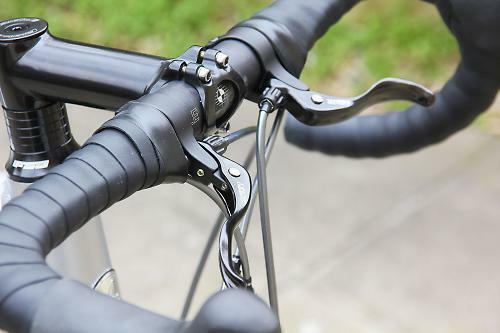 The Arkose comes fitted with cross-top levers which is a good thing if you like cross-top levers, which I don't. I took them off. One braking issue did raise its head. Halfway through the HONC ride I had to stop to sort the rear brake out, as it was dragging heavily on the rear rotor. I unwound the outside pad which freed things up, and set off again, but 10km later it was rubbing again. It turned out that I was catching the rear calliper with my heel and the action of hitting it was winding the pad in towards the rotor. Once I'd worked that out I was careful not to kick the brake any more and it didn't happen again, but it is an issue from time to time with wider rear triangles and big feet. Currently the bike is wearing a set of TRP's new semi-hydraulic Hy/Rd callipers and they don't stick out as far, so it's no longer an issue. The only other issue I had during testing was that the headset worked a bit loose; this turned out to be because the spacer stack wasn't quite big enough to tension the bearing properly. Swapping a 5mm spacer for a 10mm one sorted that. My overall impression of the Arkose Three is of a solid bike that puts in a good show across the board. If you're looking for something that will take the strain of daily use and also be up for the odd weekend excursion – even the odd CX race – then it's a tempting package for the money, especially if you can get one on cycle to work. The bike's performance is solid rather than stellar but it doesn't do anything badly, and that in conjunction with the fact that it's very good value means it's certainly one to add to your list. 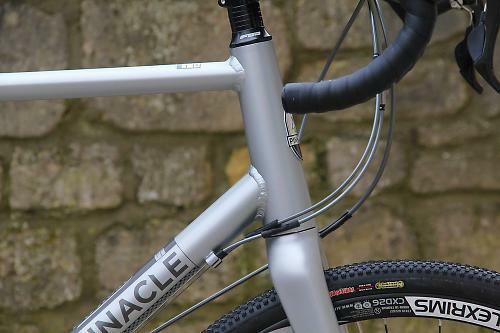 The Pinnacle Arkose Three 2013 Cyclocross Bike uses a Shimano 105 10-speed drivetrain with Avid's renowned BB7 disc brakes offering near-hydraulic braking performance in any weather. The Arkose rolls fast over tarmac, towpaths, woodland trails and country bridleways. It takes influence from Cyclo-Cross race bikes without compromising its intended use as an efficient high-mileage, all-round, cross-terrain machine. Using a tapered-steerer all-carbon fork and a taper-oval top tube for accurate handling and reduced impact shocks makes this a comfortable ride at speed. The geometry is relaxed enough for high-speed off-road use in wet conditions as well as retaining a neutral feel on tarmac. A chainstay disc mount with maximum heel clearance matches well with narrow Q-factor road chainset and ensures simple fitting of mudguards or racks. I've been riding one of these for 6 months now and have been impressed. One thing I have struggled with is the front mudguard. Anyone else got one and fitted one up front? I managed to get some SKS chromoplastics fitted with some creative bending of the stay. I'm bemused as to why they raised the bosses from the drop out but not far enough to actually clear the brake. 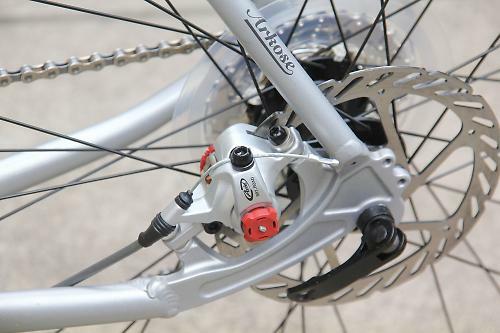 Does anybody know why other manufacturers don't do what Cotic do and put the front disc caliper on the front of the fork leg rather that the rear? Just a guess (as a mechanical / aeronautical engineer) - it may be as it pushes the mounts onto the fork leg rather than away from it, so the weld joint is in compression, not tension. Failing that, just a particular designer's approach. Getting the mech further away from the ground and crud would seem a better choice. This bike looks great, I'd love to see horzontal dropouts and slotted brake mounts though for real versatility. Evans are selling frame only (no forks sadly) for £110 at the moment online - a good one for the tinkerers! I've been riding the Arkose Two for 4 months; have not yet fitted mudguards. Apart from the bar top levers, which had to go, and a Brooks saddle fitted, I'd say the bike is perfect as a commuter in all respects. Excellent value, above all. I don't like the bar top levers either. I haven't removed them yet as I assume that I'd have to replace the full length sealed cable liners and re tape the bars. Is there a way of getting rid of them without doing this? Other than that, this is a great commuter. I've stuck SKS chromoplastics and panniers on it to make it look really cool. Also the brakes squeal A LOT in the wet. technically you should do that. but you can just take the crosstop lever out, jut up the two bits of outer against each other and seal the joint with something like electrical tape. in theory that junction could affect braking performance, in practice it's not usually noticable, i find. I've done it on a few bikes.